The wild gerbil is described as being Agouti in colour, this being a golden coloured top coat that is heavily ticked with black with a white belly. This coat colour best suits the gerbil in the wild as it aids camouflage, helping the animal to blend into its surroundings. This colour effectively helps to protect the gerbil from its predators. The belly of the gerbil is white as this helps the animal to thermo-regulate itself. Once in captivity and no longer needing to protect itself from predators or the extremes of climate of its natural wild surroundings, both scientists, gerbil breeders and keepers eagerly awaited the first mutation to occur in the domestic population. Although Mongolian gerbils had been in captivity since the 1930's, it was only in the 1960's that their popularity truly took off as a new household pet. Soon after this date the first coat colour mutations started to appear. None had yet appeared in laboratory populations. In 1969 in the U.K. the first ever Gerbil Show was held by the Birmingham Mouse Club on 23 February. The event was a big success with more gerbils being shown than had been expected. All the gerbils shown were Agouti coloured. The original standard for the Golden Agouti was published in the British magazine, Fur and Feather on April 10th of that year. In May 1969 the National Gerbil Club was formed. The announcement was made in the Fur and Feather by Bert Cooke. 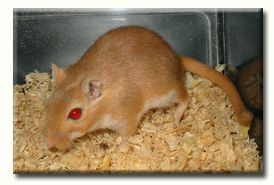 The spotting gene first appeared in a litter of gerbils owned by the Peterson Hamstery in North Carolina. 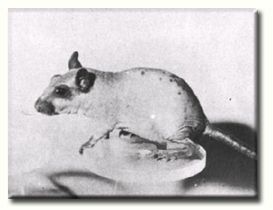 When initial numbers increased, some of the spotted gerbils were passed to Haley Farm in Virginia. The spotting gene is a dominant gene and can appear in any coat colour variety. It was imported into the UK in late 1967, sent from Canada by Frank Lane to Eric Dukes and Tony Jones. It is for this reason why this marking was commonly nicknamed Canadian Whitespot by fanciers Over the years and also probably due to the influence of other gene mutations that seem to co-operate with Dominant spotting to extend the white markings, and also the accumulation of further modifying genes that bring about the extension of white markings, have all helped to form new and different recognised patterns such as collared, collar & blaze, mottled and variegated gerbils. Waring, A.D., Poole, T.W. & Perper, T. 1978. White spotting in the Mongolian gerbil. The Journal of Heredity, 69, 347-349. 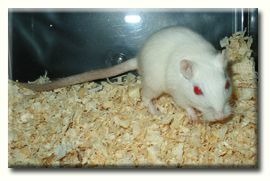 The Himalayan gene which produces white gerbils with a dark tail and red eyes were reported in the UK pre 1970. The British magazine the Fur and Feather reported in 1970 that there had been white coloured gerbils, as well as spotted imports in the U.K. for a number of years. In the U.S. it was unknown until at least the mid 1970's. Robinson, R. (1973). Acromelanic albinism in mammals. Genetica 44, 454-458. This was the first recorded account of the Himalayan mutation in the scientific literature and compares the Himalayan mutation in the Mongolian gerbil to similar mutations that have occured in other domestic species. Micheal E. C. Robbins (1976) Seizure resistance in albino gerbils.- Laboratory Animals 10, 233-235. This report showed that when researchers tested on a weekly basis for spontaneous epileptiform seizures they showed that only 16% of the albinos had seizures compared to 41% of their agouti litter mates. It was suggested that It seemed probable that the significantly lower seizure rate could be the result of some unknown pleiotropic effect of the acromelanic albino gene, although the introduction of a factor for low seizure susceptibility that is closely linked to the acromelanic albino gene shouldn't be ruled out. Leiper, B.D. & Robinson, R. 1986. Linkage of albino and pink-eyed dilution genes in the Mongolian gerbil and other rodents. The Journal of Heredity, 77, 207. The first black gerbil was bred by Air force Sergeant Norman W. Olson, it was a male gerbil, it wasn't until the third litter that the parents produced 3 black females. With 3 pairs of young black gerbils and some advice from Tumblebrook Farm* Norman Olson set about breeding the pairs, the first litters were killed by the parents but eventually litters were raised and some of the offspring were given to Tumblebrook Farm for development and distribution. 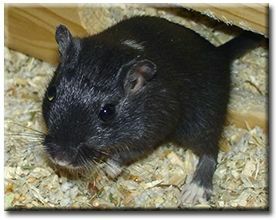 The black gerbil made its debut in the UK in the late 1970's when Richard O Grady and Mina Henley working for Glasgow Zoo imported 24 of the black gerbils. After they had spent their 6 months in quarantine the gerbils were bred with the new Argente Golden (see below) eagerly hoping for a new colour. The initial breeding of these produced 26 golden agouti gerbils as expected, it was the offspring of these gerbils that would bring the new colour. A pair of these golden agouti offspring were given to geneticist Roy Robinson, leaving the Zoo with 24. These 24 gerbils produced 243 pups, 38 black, 43 argente golden, 146 agouti, and 16 of the new colour, Dove(now known as Lilac, the Dove coat colour as we know it today was previously known as 'Silver' by enthusiasts). However they were to be pipped at the post, as the pair that Roy Robinson had been given produced the new colour too, and a few days before Glasgow Zoo did. In 1978/79 with the intention of keeping the Black and the new colour Lilac going, pairs were distributed free to members of the National Gerbil Society who requested them. The lines have been kept going, and the black is very common today and the Lilac although not as popular as it once was, is still available. *Tumblebrook farm was the first commercial colony set up by Dr. Victor Schwentker. At the time all scientific investigators obtained most, if not all of their stock from Dr Schwenker's colony. Cramlet, S.H., Toft II, J.D. & Olsen, N.W. 1974. Malignant melanoma in a black gerbil (Meriones unguiculatus). Laboratory Animal Science, 24, 545-547. This paper represents the second report in the scientific literature of a coat mutation appearing in the Mongolian gerbil. Waring, A.D. & Poole, T.W. 1980. Genetic analysis of the black pigment mutation in the Mongolian gerbil. The Journal of Heredity, 71, 428-429. A detailed and descriptive report on the non-agouti mutation, comparing it to several other black pigment mutations in the mouse. It also explained how the gene is inherited in an autosomal recessive manner and that their breeding studies showed that it isn't linked to the spotting mutation. Henley, M. & Robinson, R. 1981. Non-agouti and pink-eyed dilution in the Mongolian gerbil. The Journal of Heredity, 72, 60-61. This report included breeding studies that combined both mutant genes which then led to the first Lilacs appearing. Allan, D. and Robinson, R., 1988. Assortment of coat color genes in the Mongolian gerbil. Journal of Heredity, 79(5), 386-7. This paper was the second report about gene linkage in gerbils and looked at linkage between several coat colour mutant that were available at the time. Researchers demonstrated a recombination of 40% between non-agouti and dominant spotting which wasn't found in the earlier study by Waring et al. The Grey Agouti gerbil was first discovered in a London petshop, it later died out but a couple of years later it appeared again and is now very common in the UK and Europe, although in the USA it is still an uncommon variety. There were however several reports of Grey Agouti gerbils in the U.S. particularly on the Eastern Seaboard. These may have died out prior to a further import, sent over by Brian Leiper in Scotland to the U.S. in May 1997. Leiper, B.D. & Robinson, R. 1985. 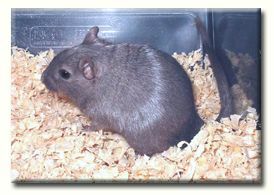 Gray mutant in the Mongolian gerbil. The Journal of Heredity, 76, 473. The Slate coat colour was originally described as Dark sepia, and Slate itself was previously named 'blue' in the U.K. gerbil society (N.G.S.) because of the distinctive blue tinge the animals once had to their coats. The pink eyed gene which produced the Argente Golden was first discovered in a North London School, it was this colour which was bred with the black gerbil in Glasgow Zoo. Fanciers soon took advantage of this new mutation, and when combined with the recently discovered grey mutation, plus the older mutations it led to many new colours. White-Bellied Cream (ggpp) - This colour variety was originally described as Pale cream or ivory in the previously mentioned scientific paper on the grey mutation (1985) and is probably the origin of the term "Ivory Cream" for this coat colour. Ruby-Eyed White (aaggpp) - This colour variety was originally described as Off white in the above Scientific paper published about the grey mutation. H H Swanson: (1980) The 'hairless' gerbil: a new mutant. Laboratory Animals, 14, 143-147. 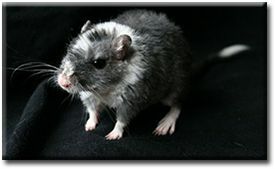 Schimmel is the name which Germans use to describe the fading of Lippizzaner horses, and it has been used to accurately describe this gerbil coat mutation. The mutation first occurred in the USA on or around 1980 but its origins have been poorly documented. In Europe the German gerbil breeder and GGG (Gerbil Genetics Group) member, Vera Brückmann first observed this coat colour, in August 1994 in a pet shop in Austria. 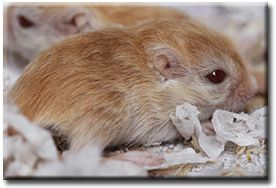 She initially gave these gerbils the descriptive name Orange Siam, because of the similarities adult Schimmels have to colourpoint coat varieties, like the Siamese. 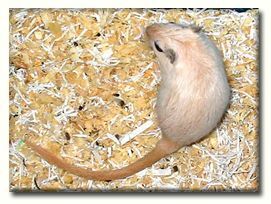 As adults they retain orange pigment only on the extremities (nose, ears, paws, and tail), and the body of the gerbils fade from its juvenile honey colour (as a juveniles the coat colour strongly resemble that of dark eyed honey's) to an off white colour as the gerbils age. Later they discovered that this coat colour was caused by a novel mutation at the Extension Locus. The dark eyed honey and schimmel coat colour mutation occurs on the same locus, but the schimmel with its fading coat was designated the symbol e(f) (f standing for fading). The gene arrived in the UK in March 1998 from Holland. It is still regarded as extremely rare in UK. This colour mutation first appeared in the United States; the same mutation occurred again slightly later in Europe and was first discovered in Poland. On 20 March 1993 the first gerbils with this coat colour were imported from the Poznan Zoo in Poland into Germany. In Germany the gerbil was initially called Algerian fox as previously it was thought that it was a new gerbil species that came from Algeria! Later they discovered that this "new species" was in fact a coat colour mutation of the Mongolian gerbil, and had first appeared in the United States. In October 1994, Fred Petrij (GGG member) imported the first Dark eyed Honeys, (as they are now named) into the Netherlands from Belgium. The gene arrived in the UK in January 1997 from Holland, and has descended from these European lines. The DEH has proved to be extremely popular and can now be found in petshops in the U.K; however some of the ee coat colour varieties are still classed as uncommon in the UK. The introduction of this gene led to an explosion of new colours. Note: Due to geographical reasons, not all possible colour combinations could be produced with the appearance of the new mutant 'e' gene. An example of this is the Silver Nutmeg coat variety which was theoretically possible in the mid 80's as all the required mutations had arisen to produce the coat colour variety by this date. However at this time the Extension of yellow mutation 'e' was unique to North America, and the Grey gene 'g' was virtually unknown there. In effect this meant that the very first Silver Nutmegs were not bred until the 'e' mutation appeared in Europe in the 1990's. The first scientific paper published on both recessive yellow and fading recessive yellow in the Mongolian gerbil which gave both descriptive accounts and breeding data was also the first paper which included the study by M.P. Gabel (2004) who cloned the MC1R gene in the Mongolian gerbil and explored both recessive yellow and recessive yellow (fading) at the molecular level. Petrij F, M. Mettler M, V. Brückman V, van Veen K, Recessive yellow in the Mongolian gerbil (Meriones unguiculatus). Journal of Experimental Animal Science 43 (2007) 319–327. 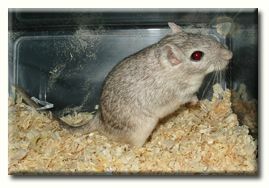 The "Burmese" gerbil was discovered in a pet shop in Ireland. 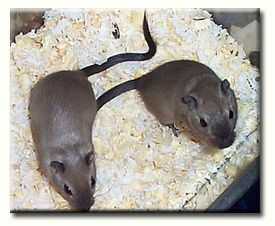 A former NGS member Johnathon Strutt, travelled to Ireland and purchased these gerbils and imported them into the UK. They have since been sent to the USA from Brain Leiper in Scotland in May 1997 and exported to Europe around 1996-97. Petrij F, van Veen K, Mettler M, and Brückman V. 2001, A second acromelanistic allelomorph at the albino locus of the Mongolian gerbil (Meriones unguiculatus). Journal of Heredity, 92(1), 74-78. The paper reports a second mutation at the C-locus that closely resembles the Sable coat variety in the rabbit. The gene dilutes the coat, removing the yellow pigment whilst retaining colour at the extremities. On an Agouti background it produces the Colourpoint Golden Agouti, a silver grey looking gerbil lightly ticked with cinnamon. 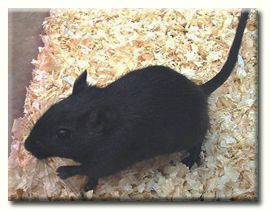 On a self or black background the gene dilutes the coat of the black gerbil to the well-known Burmese coat variety. 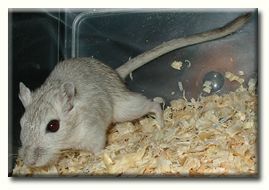 The dilute gene was discovered in Gerbils being kept at Osnabruck University. It was imported into the U.K. in 2002 and is still exceedingly rare. The original population were of very low fertility, and never properly distributed to breeders. However later imports were of much better quality and continue to breed well. The gene has also recently reached the USA in 2008 from a Finnish import, and Canada in August 2010. The Dilute mutation behaves in a similar fashion to the Maltese (blue) dilution gene in other species, but differs in the fact that it mainly dilutes black pigments, and is largely ineffective at removing yellow pigments. It also differs from Maltese dilution in the fact that the mutation also has the ability to cause strong eye dilution. 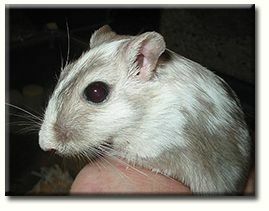 Around the year 2000 Michele Inman, a gerbil breeder from Illinois, U.S.A. bought several gerbils from a pet shop and it is from these foundation gerbils that Michelle first noticed, then eventually isolated the cream mutation. Michelle had already done a great deal by test breeding the mutation on to many known colours and arrived at the conclusion that the mutation resided at our currently known Grey locus. Allelic complementation tests conducted in late 2008 also confirmed Michelle's initial breeding results. As the gene is allelic to both the Grey Agouti and Slate coat colours it puts into question the existence of a grey locus and comparisons to mutations in the mouse show that the two mutations (cream and grey) bear very close resemblance to existing mutations at the Underwhite locus. The Grey gene actually appears to be an intermediate allele of Underwhite and similar to underwhite it has the ability to dilute the yellow in the coat to a cream colour. However being an intermediate allele it is only able to slightly dilute black pigments where the Cream (underwhite) gene completely removes them. 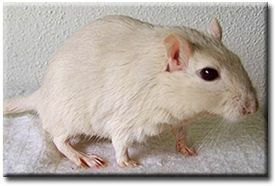 Appearing initially in Swiss and Czech stock, then a little later in Germany & Austria, gerbils started appearing that had white markings exceeding 90% of the coat, leaving the base colour quite hard to recognise. These gerbils also showed health problems too in the form of deafness and hyperactivity. These extreme white gerbils were apparantly the result of dominant spotting co-operating with a then unknown spotting gene to greatly extend the white markings. Breeding studies conducted in Germany/Austria showed that when the gene was isolated it produced an animal whose coat colour was first referred to as "White Paws". These show extended white markings from four white feet up, to small white patches on the forehead and neck as well as belly spots. The gerbils also have odd coloured toenails, with some being clear and others pigmented. On Agouti type coats the gene is virtually impossible to spot except for the odd coloured toenails. Because of this, breeders are discouraged to breed this gene onto Agouti as it can spread unknowingly in the population. Some are reminiscent of Dominant spotted patched gerbils, but are missing the white tail tip. The single neck spot is not at all typical for Dominant Spotting. Unlike Dominant spotting, the gene appears unable to dilute black pigments, but dilutes yellow pigments. The White Paws are the result of the gene being in the heterozygous state (Sls+). When the gene is in a homozygous state (SlsSls) it produces the "Rumpblack" gerbil. This gerbil, as the name suggests, carries pigment mainly around the rump leaving the rest of the coat white. Unfortunately this type of gerbil dies roughly around weaing time from megacolon. The gene also has appeared in UK pet shops around 2008 from commercial stock. 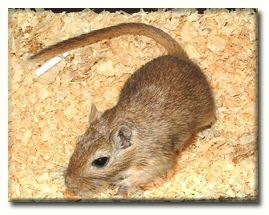 The waved gerbil, unlike the coat colour mutations is a hair structure mutation and as such affects the way the fur grows. The waved effect can occur on any coat colour. It first appeared on 18/08/2007 in a litter of gerbils bred by Catherine Jakubczyk in Poland. 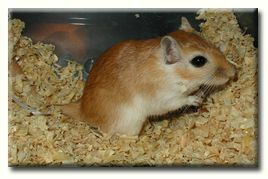 The variety is much smaller than a standard gerbil, especially as a pup and their growth is slower. The hair is very soft, shiny and velvet like and pleasantly waved as a juvenile. As an adult the gerbils coat takes on a plush appearance, as the waving in the fur becomes less apparant. The vibrissae (whiskers) are markedly impaired (a trademark of all rexoid mutants) being bent, curly and thinner. As adults, the vibrissae tends to become less impaired. Appearing in the Czech Republic at almost the same time as the recessive waved gene, occurred another similar hair structure mutation now known as Rexoid. The gene closely resembles both the Rex & Caracul gene in the mouse. However in the gerbil, this gene hasn't been fine mapped at the molecular level, so for the sake of clarity it is named Rexoid. It should be noted however that the Caracul locus is common to most domestic species, where as the Rex locus in mice isn't. (In fact in many domestic species where it has been labelled as the Rex gene, it has later been proven at the molecular level to be the result of a mutation at the Caracul locus)The heterozygotes, have similar fur growth to the recessive waved gene, but the fur appears rougher, more open and almost scruffy looking! The vibrissae (whiskers) are also extensively curled and bent as a juvenile but become less impaired with each successive moult. Allan, D. and Robinson, R., 1988. Assortment of coat color genes in the Mongolian gerbil. Journal of Heridity, 79(5), 386-7. Swanson, H.H. 1980. The 'hairless' gerbil: a new mutant. Laboratory Animals, 14, 143-147.